During last Feast holidays, the train station in my city was always full of people. 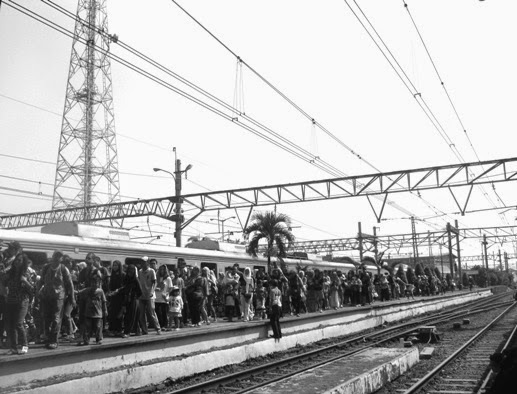 The captured crowd were the passengers who came out of the coming train. Love your contribution to the b&w theme! That's a LOT of people! Fine photo. Great shot, looks really crowded. That as a lot of people. I love this frame so creative, nice perspective lines! Fantastic shot of the crowded railway line. So many people!! Wonderful photo in B&W! Very well done! Great shot of the crowd. I guess there were a lot of travelers during the holiday.